Matt Brown injuring himself just before the biggest fight of his career takes the 'Worst Injury of 2013'. Like every year, 2013 had its share of injuries that led to disappointments, whether they happened in the cage or on training mats or elsewhere. The one that seemed to resound the most, however, didn’t involve a UFC championship belt. Instead, it was a matchup that seemed destined for combat brilliance. 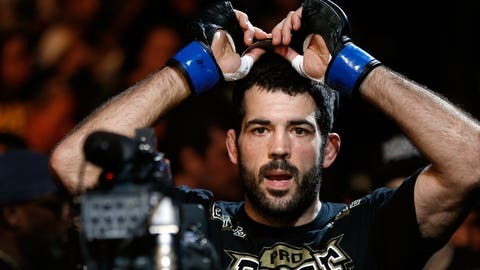 Yet just one week before it was due to happen, it fell apart, when Matt Brown was forced to withdraw from UFC on FOX: Johnson vs. Benavidez 2 with a back injury. When it was announced as officially off, you could almost hear the collective groans. Brown was simply working for a takedown in practice — albeit with improper technique — when his back went out. Despite it, he still wanted to complete the fight purist’s dream and compete against Carlos Condit before his wife and coaching staff talked him out of it. It hit me hard, and it makes me hope we can give the fans the fight again. To make matters worse, it was the most significant matchup of Brown’s career. For a time, with a record teetering near .500, he was mostly characterized as a journeyman. However, after a sudden push, Brown had won six straight, with four straight knockouts. So he was a rising contender, and a showcase fight with Condit could have put him over the top as a legitimate title challenger. Unfortunately, it was not to be. At least not for now. Both fighters seem to still want it, and hopefully, the expected payoff will be worth the wait. "He’s still on my mind," Brown said. "Getting all the responses from fans about how big of a fight this was, I don’t think about that stuff too much during camp and leading up to fight. I don’t really realize how much it means to people. It hit me hard, and it makes me hope we can give the fans the fight again." I know what you’re thinking: How is this not No. 1? You have to admit, while it was terrible for the fans to miss out on a main-event pairing and be stuck with Ilir Latifi in a headlining slot, you have to admit it turned out pretty good for Gustafsson, who bypassed the fight and went right straight into a title fight with Jon Jones. Again, this seemed like a tragedy when it happened, robbing us of a chance to see Pettis against Brazilian wrecking ball Jose Aldo in a dream fight. However, the UFC managed to make lemons into lemonade, inserting the always exciting ‘Korean Zombie’ in against Aldo, and moving Pettis into a lightweight title fight with Benson Henderson. The rest is history. Probably the most gruesome visual of the calendar year in the UFC happened without anyone initially noticing. It was only after the fight was over and the adrenaline wore off that Jones started favoring his left foot. Replays showed his big toe grotesquely dangling off the side and bleeding. It turned out to be not a break but a severe dislocation, and Jones was back in the gym after a few weeks of healing time. All you have to do is take one look at the X-ray that Struve released to understand the power possessed by the man who did it to him, Mark Hunt. Struve has always been an action-oriented fighter (only 2 decisions in 31 pro fights), and this time, it just wasn’t his night.